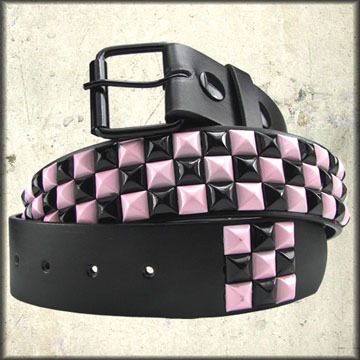 Hard Wear Pyramid studded belt features three rows of pink and black metal studs. This belt includes silver metal buckle that is removable and can be swapped with any belt buckle. Bonded Leather, 7 Belt Holes For Adjustable Fit, Black and Pink Reflective Pyramid Studs, Belt Width 1.5". Sizes: S (30-32), M (33-35), L (36-38), XL (39-42), XXL (43-45). Color: black.